According to ICANN regulation, whenever a domain is registered, accurate contact information must be submitted along with that registration. This information is then made publicly available through a WHOIS search. All domain owners are required to maintain accurate and valid personal or business contact information in their WHOIS data; however, you can keep this information private by enabling WHOIS Privacy Protection. WHOIS Privacy Protection offers to protect your personal domain registration information from public WHOIS searches. Privacy Protection for your domain is only $14.95 per year, $25.90 for 2 years, or $38.85 for 3 years. 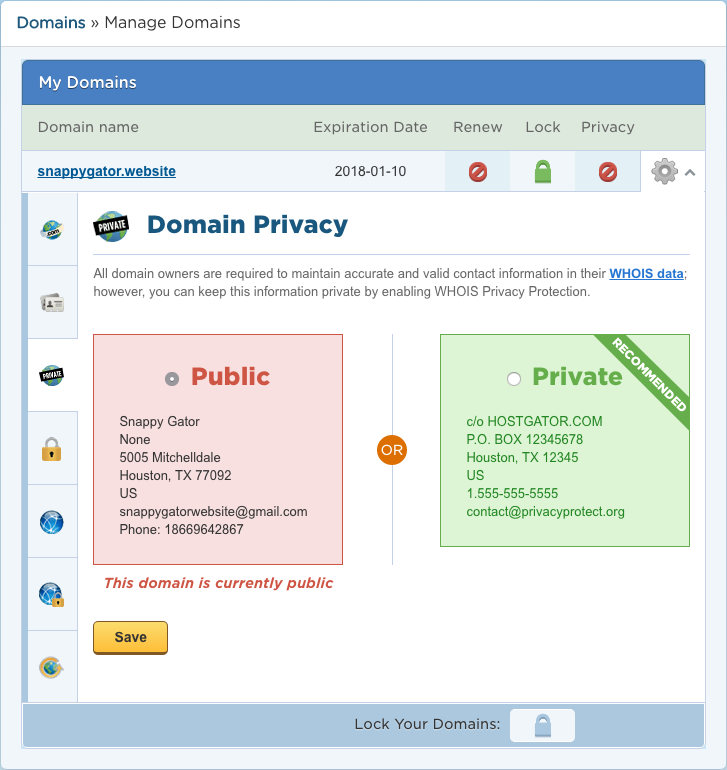 Most eNom and Launchpad domains can now be managed in the registry tool at register.hostgator.com. Log in with your billing account email and password to access any domains attached to that billing account. 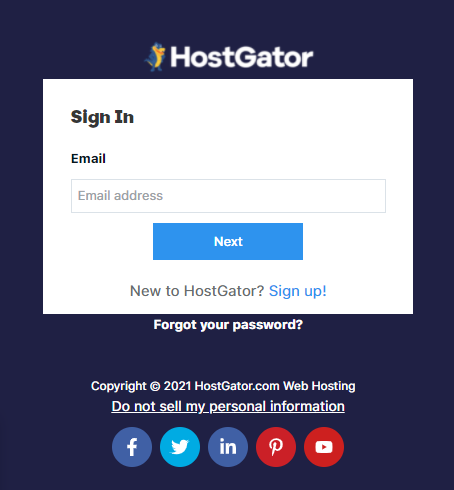 (This will be the same login as http://portal.hostgator.com.) Once logged in, you will see any domains attached to the billing account along with basic information about each domain. Note: If you forgot your password, click on the Forgot your password link below the login fields to reset your password. By clicking on a domain name, you can get to the Domain Overview which will show more details about the selected domain and provide access to several other functions. Click the Domain Privacy tab from the left-hand menu. On the Domain Privacy page, select the Privacy ON radio button to enable Domain Privacy, or select the Privacy OFF radio button to disable Domain Privacy. Click Save Domain Privacy to save your changes. You will be invoiced the $14.95, and WHOIS Privacy will then be enabled for your domain. If you have any questions or if you require further assistance, feel free to contact us via phone or live chat. We will be happy to assist you!